This book is free on these days only – 08/17/2014 at midnight PST until 11:59 pm on 08/17/2014. If the dates are the same that means the book is free one day only. It’s not so easy to post a cool or funny comment on Facebook EVERY day of the year, is it? Social media, especially Facebook, for most of us is part of our everyday lives, right? It’s interactive, funny, informative and just downright addictive. But, don’t you ever wish that you didn’t have to try so hard to come up with some witty, funny, or ironic update? 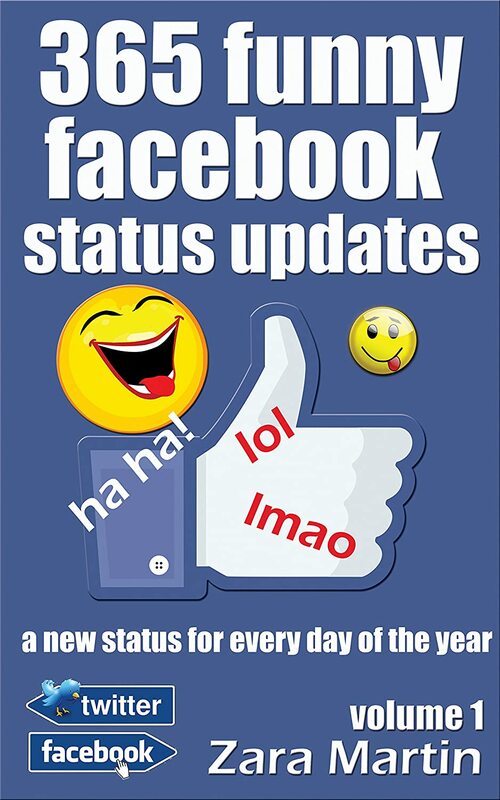 Wouldn’t it be great if you could effortlessly post a new update EVERY day that was guaranteed to draw attention, make people ‘lol’, comment and ‘like’ by the bucket load? These Funny Facebook Status Updates make it easy to interact on Facebook or Twitter, even when you have nothing else to say… and they are funny, if not entirely politically correct at times. So, have a look inside & if you think you could use a whole years worth of witty Facebook Status Updates for less than a penny each, download now & post a new update in the next few minutes… and watch the response.